Do you need dumpster rentals from reliable waste removal contractor with impeccable security clearance? 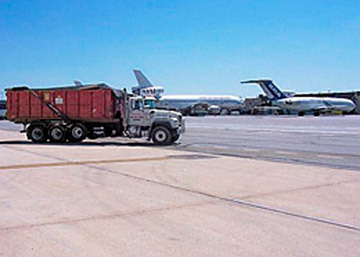 Diamond Waste meets security clearances to access secure installations such as airports, military bases and government facilities. Our dumpster rental staff is experienced with security procedures and will work with your operation to ensure safe, timely and compliant removal of waste materials. We now have Transportation Worker Identification Clearance (TWIC) as required by the Transportation Security Administration and US Coast Guard to access the Port of Baltimore. Whether you are looking for a piece of the military BRAC pie, or doing renovations at a government facility or airport, please keep Diamond Waste in mind for your roll-off dumpster rental needs. Please contact us today to find out more about how Diamond Waste can provide roll-off dumpster rental and waste removal service for your secure installation project. 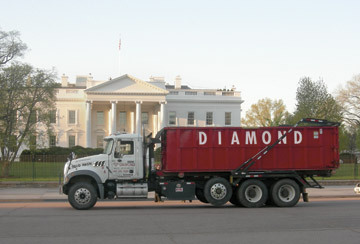 Roll-off dumpster service at the White House. 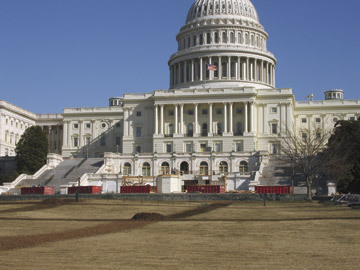 Diamond Waste dumpsters on site at the U.S. Capitol Building. Dumpster delivery on runway at BWI Airport.